It’s high season in Provincetown, Massachusetts, and Commercial Street is choked with tourists. Lobster rolls are selling fast, as are tickets to the evening’s cabaret. Sticky-faced children and sunburnt retirees stream off the whale watching boats at the wharf to mix with the throbbing 24/7 LGBTQ street parade. Posters declare that this is Bear Week, and there does seem to be a preponderance of hirsute, potbellied men moving through the crowd. Also, buff men in sequined jumpsuits. Presumably it’s too hot for the leather chaps on display in the shop windows. But on a nearby hilltop, a very different drama is unfolding at the Center for Coastal Studies (CCS). Here, the American flag is flying at half-mast. A man with sun-bleached hair and a deep summer tan stands under the lowered flag, head bowed. Lean and wiry, he has the aspect of a coil ready to spring. He pulls one last drag from his cigarette and disappears into the cool air of the marine conservation nonprofit’s newly renovated building. He was supposed to have quit smoking. He had quit smoking. Then the accident happened. Now quitting would have to wait. Like many of the tourists, Scott Landry is in Provincetown for the whales. The Ibis, the CCS research and rescue boat he commandeers, leaves from the same wharf as the tour boats and navigates the same diesel spills and habituated harbor seals as it heads out into Cape Cod Bay. Landry paid his way through undergrad by working as a naturalist for a whale watching operation; after a graduate degree in scientific illustration, he took a job at the CCS. First as a naturalist, illustrator, and researcher. Later as a rescuer of whales. 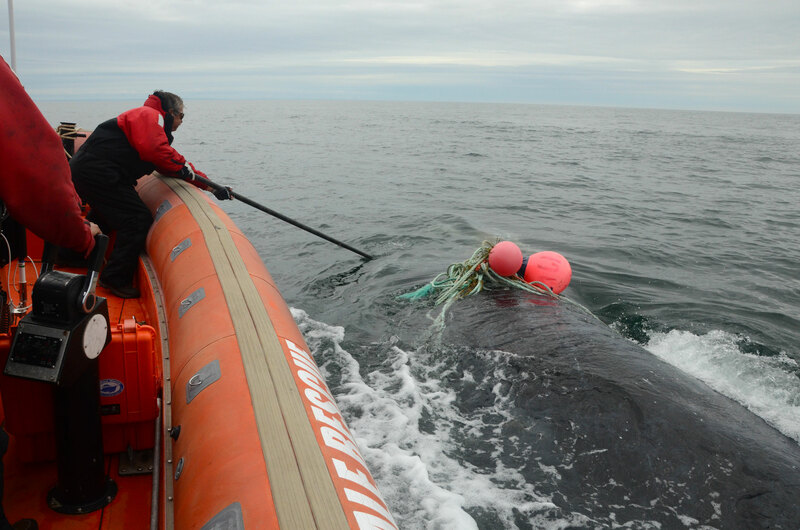 Now Landry plays a key role in the Atlantic Large Whale Disentanglement Network, a consortium of emergency responders that involves 10 teams and hundreds of people. This means that he is involved in most of the entangled whale rescue operations carried out on the east coast of the United States and Canada. Around the world, entanglement is a major driver of the whale deaths and injuries we can attribute to human activity. It’s also the leading cause of human-related deaths for endangered right whales. 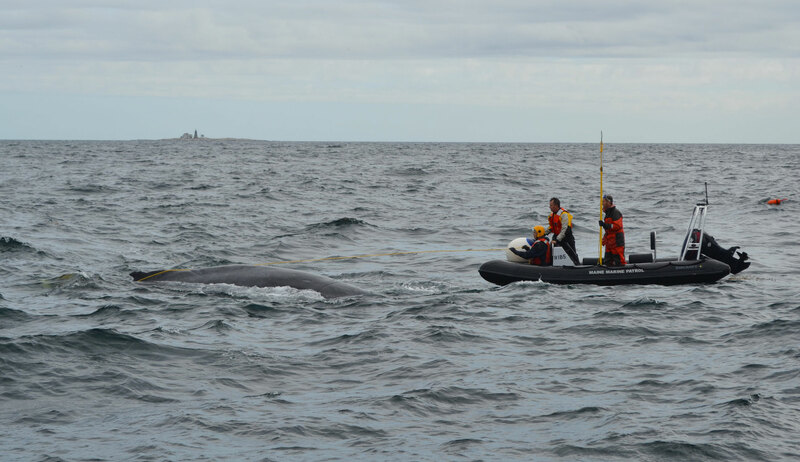 The CCS is recognized globally as a leader in disentanglement operations; it developed the protocols and standards followed by whale rescue teams around the world, and delivers training to many of them. This makes Landry and his network largely responsible for the welfare of vulnerable marine mammal populations, as well as the Americans and Canadians who risk their lives to save them. Death hangs over Landry quite literally, in the form of a massive whale skeleton suspended from the ceiling of the CCS foyer. The skeleton of a humpback named Spinnaker that he and his colleagues disentangled from fishing gear three times before she finally died. A skeleton that Landry spent hours piecing together last spring, at the beginning of what would be the worst, and most fatal, whale season of his career. The 2017 migration season—both for whales and those who watch them—had started off promisingly enough. An unusually high number of right whales swam into the nutrient-rich waters outside Provincetown Harbor, on their way to summer feeding grounds in the Gulf of Maine and Bay of Fundy. There were so many right whales in Cape Cod Bay, in fact, that Massachusetts postponed the opening of the local lobster fishery by a week to give the whales a chance to swim north before fishers dropped their lines. The strategy seemed to work. Though a calf and a juvenile were found dead, most likely killed by ship strikes, another whale survived an entanglement and the rest of the population appeared to move north without incident. Cape Cod Bay is one of seven critical habitats for the endangered species, which has been observed wintering along the coast of Florida and Georgia. But the north end of its range seems to be changing; fewer right whales have been spotted near the Bay of Fundy in recent years. Instead, the animals have been turning up farther north in the Gulf of St. Lawrence, which wasn’t even listed as a critical habitat by Fisheries and Oceans Canada (DFO) or the US National Oceanic and Atmospheric Administration (NOAA) in 2017. 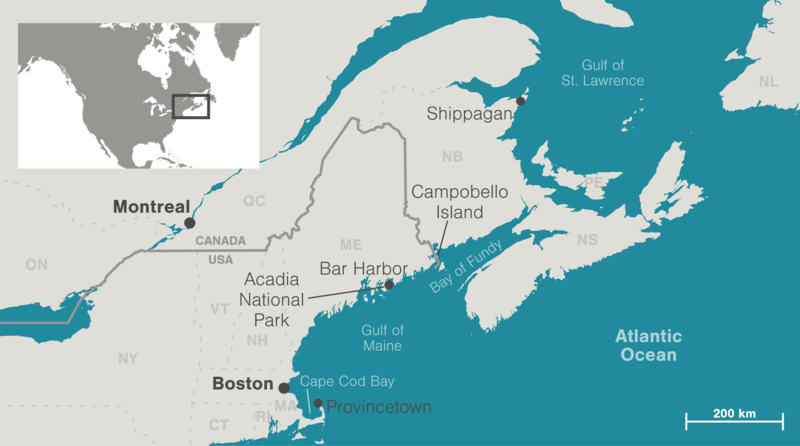 When right whales began turning up dead in the Gulf of St. Lawrence, just weeks after leaving Cape Cod Bay, the disentanglement network went on high alert. Half a dozen carcasses appeared within the space of a few weeks. The cause of death was at first a mystery; the fact that they were floating high suggested that starvation and chronic disease were unlikely causes. The business of monitoring the gulf—and the challenge of towing 60-tonne carcasses to shore for necropsies—involved five provinces and a body of water that spans hundreds of thousands of square kilometers. Trying to find a whale in such a large body of water is a formidable task, even with NOAA helping out by surveying the area by plane. Landry worried that local authorities were ill-equipped to deal with such a large-scale crisis. He was speaking with colleagues in Canada almost daily and offered to head north to help with live entanglements. 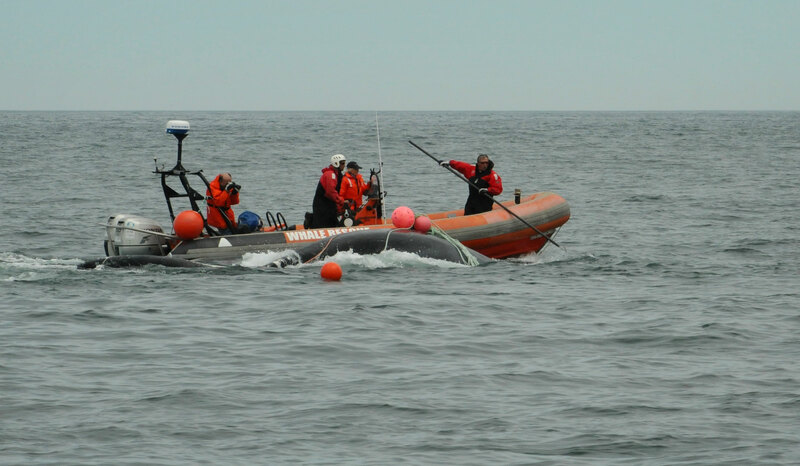 By September, another dozen right whales had been found dead throughout their range and several more had been entangled and freed by Landry and his colleagues. Necropsies conducted by DFO would reveal that several of the carcasses in Canada had sustained blunt trauma, suggesting ship strikes. 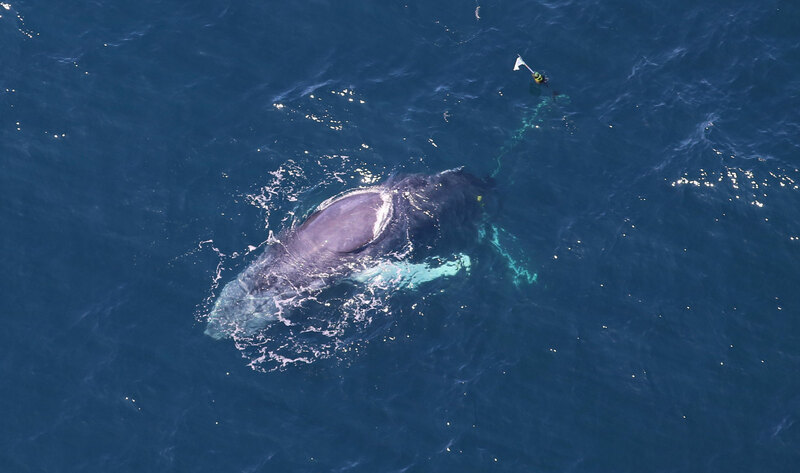 Others showed signs of entanglement, not surprisingly: 83 percent of all right whales bear the telltale scars and abrasions of encounters with fishing gear. Entanglement is not a new problem, but the severity of whale encounters with rope and fishing gear has increased significantly since the 1980s. There are more fatalities. In response, disentanglement efforts have been ramping up. Tools and techniques have become increasingly sophisticated, and more and more people are training to respond to the distressed animals. Declining right whale numbers and apparent changes in their migration patterns have made the job especially urgent. Dubbed the urban whale, this slow-swimming species likes to hang out in shallower waters along the east coast of North America, where so much human industry and activity is concentrated. Survival of Eubalaena glacialis is now considered precarious—some scientists believe it could be extinct within two decades. Even a single death is significant for the species, and for people like Landry who devote their lives to protecting the 450 or so still in existence. But the work is hard and dangerous. NOAA tightly regulates responders in the United States; DFO does the same in Canada. Both federal departments generally rely on the expertise of non-governmental employees or volunteers to perform the disentanglements. If outsiders take on the most dangerous tasks, the risk and liability rests on someone else’s shoulders. On July 5, amid daily headlines about dying whales and ensuing necropsies, a NOAA plane spotted a live entangled right whale east of Miscou Island in the Gulf of St. Lawrence. DFO called on the volunteer Campobello Whale Rescue Team on nearby Campobello Island, New Brunswick, to ask Joe Howlett for assistance. Howlett, a lobsterman who captained the Shelagh in summer when the fishery closed, was already in the Gulf of St. Lawrence, helping scientists from the New England Aquarium conduct research aboard the private vessel. As a veteran responder trained by the CCS, he was also among the highest qualified disentanglers in the country. He drove the Shelagh out to meet the whale. Teams work from a small inflatable Zodiac, using grappling hooks and knives attached to long poles to cut the ropes from as safe a distance as possible. Rescuers must hang over the boat wearing a diving mask to get the full picture of what they are dealing with. Getting in the water with a whale is strictly forbidden—until 2017, the only known disentangling fatality happened when a diver tried to disentangle a humpback in New Zealand. The 59-year-old fisherman came home bruised and battered and a hero. For the first time that season, the conservation community had a good news story to tell. Four days later, Campobello got another call for help from DFO. Another right whale had been entangled. The Shelagh left nearby Shippagan, New Brunswick, the next morning. The boat met a DFO fast rescue craft, and Howlett installed himself at the bow. This time the disentanglement was far more complex. More than 12 lines wrapped the whale. At least one was caught in its mouth. Howlett made a first cut, and turned to give the crew a thumbs up. He was grinning from ear to ear. He made a second cut, giving the whale enough freedom to move. Howlett turned and gave the crew another thumbs up. Then things went horribly wrong. The whale’s tail flipped into the bow, dorsal side down, crashing on top of Howlett. Three hours of CPR could do nothing to revive him. “Joe was like a cat,” says Greene, who was not part of the rescue. “I know he would have got out of the way if he’d seen it coming.” Greene took comfort in the fact that it was unlikely his friend had suffered. His death, unlike the deaths of so many entangled whales, appeared to be instantaneous. Hours later, a NOAA surveillance pilot watched the whale finally wriggle free of its gear, thanks to Howlett’s last act. Greene and Landry had lost a friend and colleague. Darlene Howlett had lost a husband, her two grown sons a father. And the tight-knit Campobello Island community had lost one of its pillars—a man who could be counted on to paint the church, coach the softball team, and liven up the dullest party with tales of his exploits in the coast guard before he’d married a daughter of the island and started up a fishing business with her brother-in-law. A man who would drop everything, even a paying job, to save a whale. A man who always made the peace sign when he met another driver on the road. Nearly half the island—400 people—came to his funeral. So did the minister of DFO, Dominic LeBlanc. The church was so crowded the minister had to sit upstairs in the packed recreation room that Howlett had painted a soft pinky-beige. There, the overflow crowd watched the funeral on a large screen set up under the basketball net. Around the world, the tight-knit whale rescue community streamed the three-hour service on YouTube. Landry was beside himself when I happened to call him hours before Howlett’s death was reported in the news. “There’s been an accident up in Canada,” he said in the strangled voice of someone in shock. “I can’t talk.” A week later, he would drive 18 hours to and from Campobello Island to bury his friend. But Landry stood to lose more than a friend and colleague. He had reason to fear that Howlett’s death would have global and, in the case of right whales, catastrophic consequences. Ask most whale experts, and they will tell you that American and Canadian governments rely far too heavily on disentanglement to prop up their whale conservation programs. Very little else has successfully mitigated what Landry calls an entanglement epidemic. In the North Atlantic, 10 to 15 percent of whales acquire new scars from rope each year. Landry was keenly aware that if rescue operations were deemed too risky, authorities could suspend the network’s permits. Without disentanglements, whale conservation efforts in both countries would be severely compromised. His fears were quickly realized. The day after the accident, disentanglement activities were suspended in Canada and the United States. The United Kingdom soon followed suit. NOAA instructed Landry and his team to respond to rescue calls with a camera. The crew could take photographs of suffering whales, but were expressly forbidden to approach them. It was, Landry said, the worst crisis of his career. The first time Spinnaker got tangled in fishing gear, she was two years old. It was 2006. 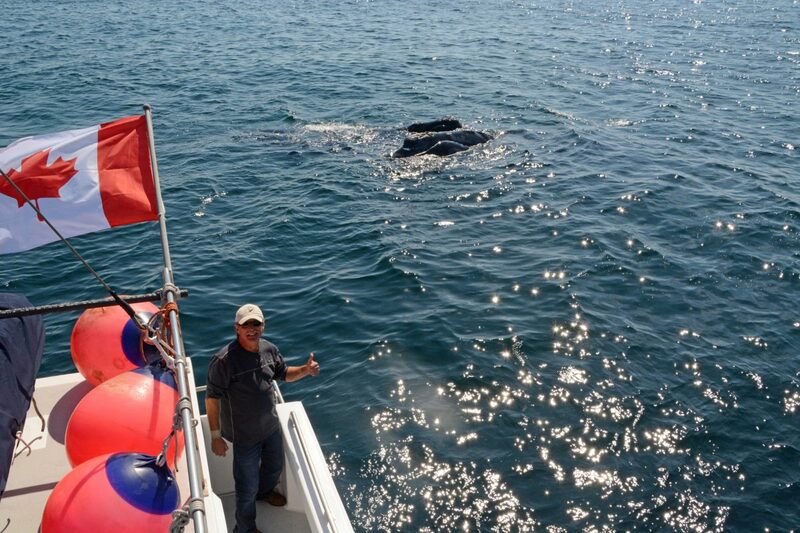 The crew of the whale watching boat Atlanticat had spotted the humpback entangled in fishing gear on one of their daily tours out of Bar Harbor, Maine. Spinnaker was a reliable feature of the tour, and a familiar sight to staff at the CCS, who had been studying her since she was a calf. New England waters have warmed over the last few decades, and some 80 percent of American lobster is now landed in Maine. But more lobster means more traps in the water baited with herring, a fish that Spinnaker probably liked to eat, and more rope to secure the traps. Mackie Greene crossed the border to meet Bob Bowman, a fellow disentangler based out of Maine, and the two men headed 32 kilometers offshore in a five-meter Zodiac. The entanglement had anchored Spinnaker to a long leash with a 90-meter radius, and a thick fog had enveloped her. Greene and Bowman spent the next hour and a half just trying to find the whale, listening to her breathing, timing her dives, trying to predict where she would surface. “One cut and it was done,” says Bowman. Spinnaker swam away. Bowman retired from the entanglement network 10 years ago, just months after freeing Spinnaker. White-haired and white-bearded, with a pair of spectacles sliding down his nose, he now works full-time as a musician, plucking easy-listening guitar at local restaurants while tourists indulge in lobster and craft beer. He assured me he’d be easy to spot when we met at a winery-restaurant on the road into Bar Harbor: just look for Santa Claus. Bowman’s colleagues would come away from a rescue elated, but “for me it was a sick feeling every time,” he says. “Because I knew this was really just the tip of the iceberg.” Scar studies conducted by the CCS suggest that only 10 percent of all entanglements are actually reported. 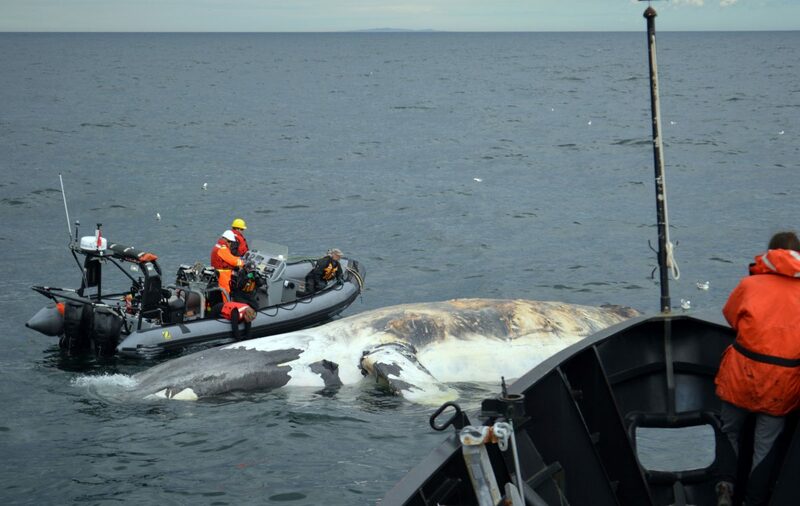 About half of all right whale deaths are caused by either ship strikes or entanglement. Between 1970 and 2009, a right whale was more likely to die from the former. Since then, ship strikes have declined significantly because US and Canadian governments have moved shipping lanes away from migratory paths and reduced speed limits in critical areas. Death by entanglement is now more prevalent and has proved a much knottier problem to solve: you can’t fish without rope, and you can’t put rope in the ocean without getting whales tangled in it. Researchers and conservationists have tried changing the color of the rope, making it glow, making it ping, making it sink. There are even projects at Woods Hole Oceanographic Institution (WHOI) in Massachusetts to develop devices that acoustically trigger the release of rope coiled on the ocean floor when a fisher is ready to pull up lobster pots. So far, these attempts have done little to alleviate the problem. The best way to reduce the severity and lethality of entanglements is to reduce the amount of rope in the water. The next best option is to lessen its breaking strength, which has nearly doubled since the 1990s. This underwater footage taken by rescuers from the CCS shows a humpback immobilized by rope. Neither of these options is attractive to fishers, who want to maximize their catch and minimize their gear losses. Lobster fishers already lose 20 to 30 percent of their gear in a year. A line that breaks before it serves its purpose serves no one. 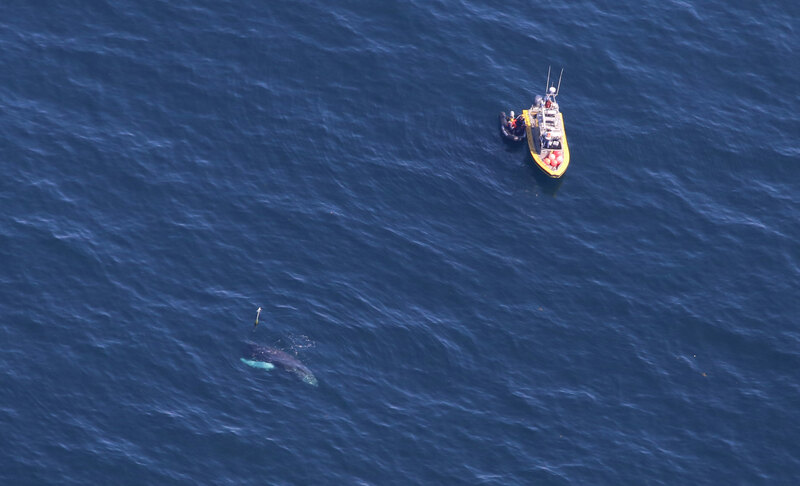 On Campobello Island, the whale rescue team’s motto has always been “Fishermen helping fishermen”: when not rescuing whales from their Zodiac, Howlett and Greene also recovered lost gear for their fellow mariners. Perhaps most problematically, the departments that preside over the conservation of whales are the same departments that also manage the fisheries, meaning they face a major conflict of interest. “We’ve got the same agency that oversaw the demise of the cod fishery trying to save whales,” says Bowman. The upshot is that despite many tweaks to fishing regulations, there is no evidence that they have reduced mortality rates among whales. But the alternatives are politically hard and tough on the fishing industry, which would have to drastically modernize, says Mark Baumgartner, an oceanographer at WHOI who uses underwater autonomous vehicles to listen for whales in addition to chairing the North Atlantic Right Whale Consortium. If it’s a Band-Aid, Bowman would say to me a few days later, it’s a Band-Aid on a gaping, open wound. The majority of entanglements begin in the mouth, when a whale is feeding. 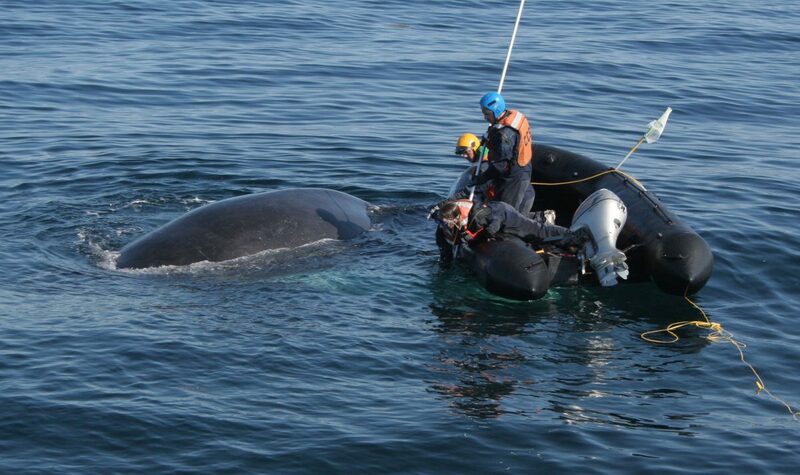 But removing a rope lodged in baleen is among the most difficult and dangerous operations a rescue crew can attempt. Veterinarians tend to advise against even trying. Lobster gear had anchored the whale, pulling its tail toward the seafloor. The humpback had to dog paddle just to stay at the surface. When he arrived at the scene, Landry stuck an underwater camera on a long pole to record footage of the entanglement for later review. Then he put on a mask and hung overboard to see what he—and the whale—was contending with. The amount of rope was overwhelming. He saw knots as thick as tree trunks. 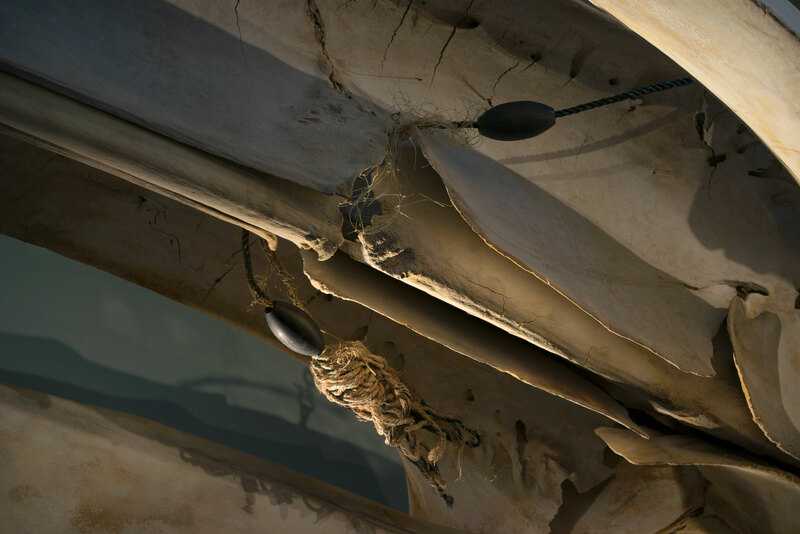 Friction and drag from the ropes had sliced through the whale’s skin and blubber. Gill net and lobster gear hung from its mouth. Later, Landry would pore over the video and study the whale’s unique fluke pattern, which resembled a billowing sail. The hog-tied whale was Spinnaker. Landry’s team attached buoys to the entanglement to make diving painful enough to keep the whale at the surface. This strategy works well for humpbacks. Right whales, accustomed to swimming with open mouths for sustained periods of time to filter zooplankton, are more of a challenge. “When they open up, it’s like opening a garage door,” says Landry. Pushing a massive, garage-door-sized bucket in front of them as they swim requires far more stamina than sprinting after herring on the rocky Maine seafloor, as Spinnaker was used to doing. Yet even a humpback can take hours to set free. 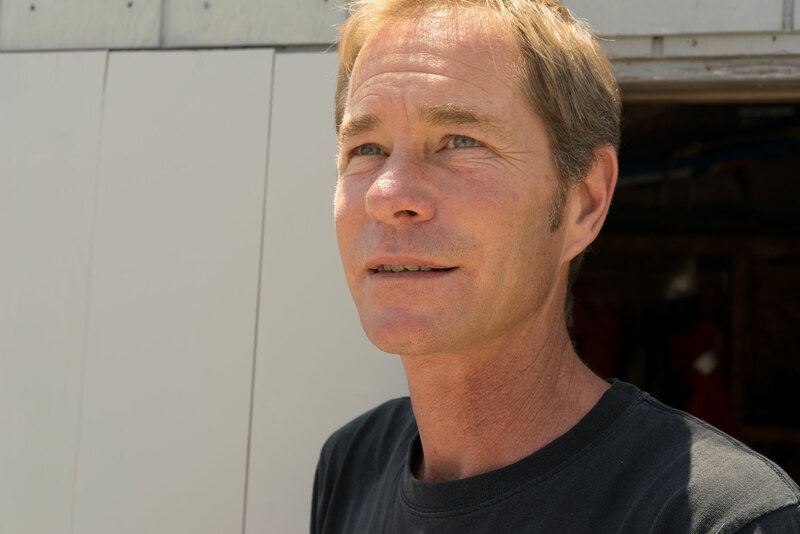 Landry and his crew spent seven hours working on Spinnaker, battling chop and swell. They couldn’t quite finish the job: a short piece of black rope still hung out the side of her mouth like a piece of errant dental floss. Landry hoped the rope would dislodge itself when she next opened her mouth to feed. Eight months later, Northeast Fisheries Science Center spotted Spinnaker next to another buoy while conducting an aerial survey near Acadia National Park. This time she was hanging in a C-shape below the surface, wrapped in rope from mouth to flukes. Ropes from lobster pots anchored her to the ocean floor. The sea conditions were better this time, and the team disentangled the whale within four hours. She was free to swim away, but she didn’t. Landry could see two pieces of rope coming out under her chin, one green and one black. He wondered if she’d let him pull them out. The green rope slipped out easily. But the black one was more of a puzzle. He could only see one end. It was possible she’d swallowed the other, or got it stuck in her baleen. Landry leaned out of the Zodiac and gingerly pulled on it. The whale yelped like a dog and paddled away. A week after Howlett’s death, Canada and the United States lifted the ban on some whale disentanglement activities. Landry’s crew would have to go through additional safety training, and teams in both countries now have extra bureaucratic hoops to jump through. They must wait for permission from authorities before proceeding with a rescue operation. Moreover, right whales—the whales most difficult to disentangle, but also the ones in most dire need of help—are still off limits. The irony is not lost on Howlett’s colleagues and friends. While the New Brunswick fisherman’s unfortunate death has brought greater attention to the plight of the right whale—and its would-be rescuers—it has also created new obstacles for those who want to carry on his work. The suspension of disentangling activities for right whales puts this species in even greater danger. Governments know they need to do more to prevent entanglements. After Howlett died, DFO closed a nearby snow crab fishery a few days earlier than planned and sent teams out to recover abandoned gear. Baumgartner thinks more closures are possible if the right whale population continues to decline. “If the public knew the true story of right whales, and the true story of fishing gear entanglements, which are horrible, horrible ways for these animals to die, I think they could get behind closures,” he says. But closures would be devastating for the fishing industry. To prevent them, Baumgartner wants to see more funds allocated to developing fishing methods that use less rope. Others want to see regulations that reduce breaking strength. The Campobello Whale Rescue Team, meanwhile, is hoping for more funding. The team’s DFO-issued boats are now 34 and 19 years old; they had to fundraise just to replace a faltering engine. Seats are bound together with tape. DFO does not compensate team members, even though volunteers often leave paying work to respond to a rescue. It doesn’t even cover all the team’s costs. And yet, such rescue teams are carrying out the only effective conservation strategy for whales on behalf of the government. Surely it is incumbent on our society to mitigate the suffering we’ve inflicted for the sake of another buttered lobster roll. When Spinnaker washed up dead on the shores of Acadia National Park a month after her final 2015 disentanglement, she still had rope caught between her baleen. After the results of the necropsy came in, Landry understood why that last tug had been so painful. The rope was embedded in her skull. It had been there for at least nine months, judging by the way the bone had grown around it. It was well on its way to cleaving her maxilla in two. A church bell rings through the cool air of the CCS foyer. Landry looks up. He is sitting underneath Spinnaker’s skeleton. When he and his colleagues painstakingly articulated the display in the spring, the right whales had been flooding Cape Cod Bay. That seems like a lifetime ago now. The black rope is still hanging from Spinnaker’s mouth, one end still buried in her skull. Her eyes and baleen are now in other people’s labs, furthering science. Although regulators determined that her death was entanglement-related, scientists are still working to determine the immediate cause. She was still eating shortly before her heart stopped. Not everyone agrees with the center’s decision to include the entanglement in the articulation. Some visitors feel it detracts from Spinnaker’s natural beauty, as a sculpture to be admired. Landry thinks it makes her presence more poignant. But there are still days when Landry is glad his office is downstairs, that he doesn’t have to walk directly under Spinnaker. Especially now, when he and so many friends and co-workers are still reeling from Howlett’s death. It’s been only a week since he got the news. Days since the funeral. The church bell stops ringing and Landry and I step out into the sun to walk down to the wharf, past the 24/7 tourist street party. Landry looks across the parking lot at the swath of red, white, and blue blowing in the wind. “How long do you leave a flag flying at half-mast?” Landry asks me. 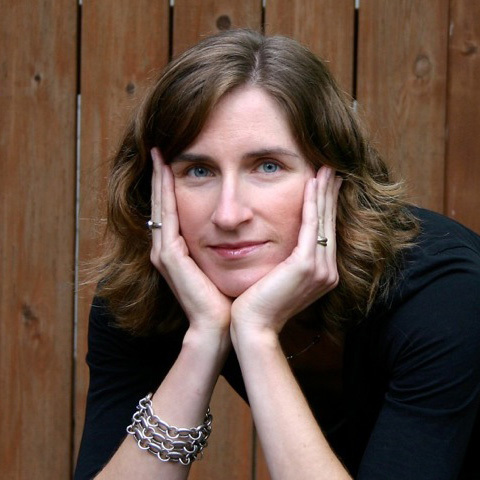 Cite this Article: Sasha Chapman “The Noose Beneath the Waves,” Hakai Magazine, Jan 23, 2018, accessed April 23rd, 2019, https://www.hakaimagazine.com/features/the-noose-beneath-the-waves/.